Both figuratively and literally, the notion of a well figures prominently in scripture, literature and indeed in life. The “water” it holds has the potential to be all cleansing, life giving, and life affirming for the one who seeks and believes. Experienced as endless or empty, pure or tainted, cherished or wasted it holds the capacity to sooth the soul and reinvigorate one for the steps ahead. Without it, we cannot last long in this world or the next. 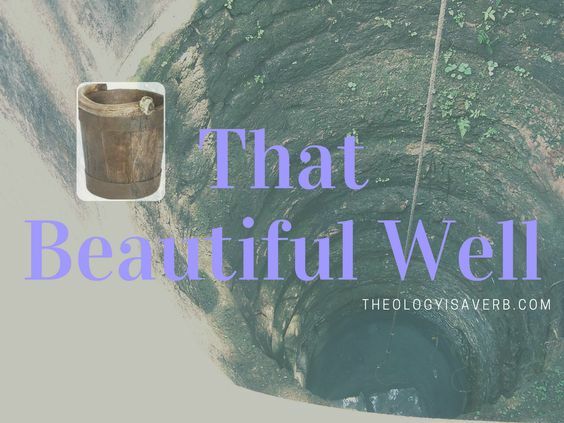 Today, many of us have become so accustomed to the modern convenience of running water we are unfamiliar with the experience of drawing from a well at all. The tall deep stone outer walls and inner hollowness invoke a both a mystery and a knowing that within something special is waiting to be unearthed. Yet, in order to plunge into this discovery, we must first make the journey to the well and then in faith lower our bucket. The beautiful story in John of the Samaritan woman at the well enables us to glimpse a bit of this faith journey. Here, what would have been a very social fellowship of women gathered, was not so for her. Now having been married six times and a Samaritan at that, she was considered an outcast, and unwelcome guest. With full awareness of this, she had chosen the hottest part of the day to acquire water when she expected no one else to be around. However, to her surprise not only was Jesus there but he, with little regard for societal rules, was speaking directly to her. What did Christ see in her that would prompt such amazement in her return home? First he recognized that this woman had lived her life simply seeking the satisfaction of her everyday physical needs. While her intention was to satisfy a temporary physical thirst, Jesus revealed her deeper continual spiritual thirst. For, “Everyone who drinks this water will be thirsty again, but whoever drinks the water I give him will never thirst.” Christ calls her to a different intimacy, one which was not dependent on her value in the world but bespoke of her inherent worth to God. His desire was to fulfill her deepest need and invite her to move from a mere existence to a life everlasting. What then was required of her? Well, in order to be healed she needed to be aware of her thirst, confess her transgressions and then… lower her bucket. Do I recognize my own incomparable value to God? Am I seeking only temporary satisfaction of my daily needs? If not, what can I do to lead others to the well? There’s a great deal going on in that narrative. Thanks for sharing this.